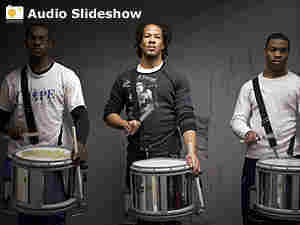 Howard University Band Bound For Inauguration Howard University's Showtime Marching Band will be one of six outfits from historically black colleges and universities playing in the inaugural parade for Barack Obama. It is the first time the Washington, D.C., band will perform at an inauguration. On Tuesday, Howard University's Showtime Marching Band will high-step into history with the newly sworn-in 44th president, Barack Obama. Howard's band is one of only six from historically black colleges and universities, or HBCUs, selected to play in the 56th inaugural parade. More than 1,300 groups applied to be in this year's parade; 90-plus groups are expected to perform. Howard's band director, John Newson, has been in charge of the Showtime Marching Band for 22 years. The group has performed in music videos, NFL halftime shows and Macy's Thanksgiving Day Parade. But this was the first time Newson ever applied to be in an inaugural parade. "I'm not a parade person," he tells Weekend Edition Saturday host Liane Hansen. "And don't get me wrong, we've done major parades [with] Macy's and so forth before. But this was one that I felt that I personally wanted to do." Newson, who decided in August he wanted the band to participate, shuns any notion that he applied early because he thought Obama was going to win. "I'm just a good pray-er that's all," he said. Newson's prayers were apparently answered. But the supporting videos, photos and essay he submitted also must have convinced the inaugural committee to allow the Washington, D.C., school to have one of the coveted spots in the parade. The good news came at an inconvenient time: Newson got the call in the middle of December, during final exams and as students were preparing to head home for the holidays. Rehearsals didn't begin until Jan. 7. "That's when everyone got back in town. So, this is pretty much our fourth rehearsal," he said Wednesday. Newson decided that with the parade less than a week away, he would bring in some help. "We needed a little bit more, and I wanted to juice it up. What we've done is combine the band, and we have some of the students from the jazz ensemble, some of the students from the concert band and some alumni," he said. About 200 members of the band will participate in the march down Pennsylvania Avenue. For a moment, it looked as if the Stevie Wonder hit "Signed, Sealed, Delivered" was going to be part of Howard's parade repertoire. The Motown song was in heavy rotation during the Obama election campaign. But with several HBCUs staking claim to the song, Newson decided to call another tune from his playbook. "The Boss," a Diana Ross song. Newson doubts there will be an opportunity for a battle of rival bands from the HBCUs. "Everybody's asking that question, but the way they have the parade structured, none of us are close to each other — which maybe is good in a way." Of the rival bands, Howard will be the last in the procession. Newson isn't counting on the band getting the chance to blow everyone else out of the water. "But we're going to do our thing and if we get a chance to stop and do something, we will," he said. The other HBCU bands participating are Florida A&M University, the University of Arkansas at Pine Bluff, Delaware State University, Louisiana's Grambling State University and Virginia's Hampton University. Sophomore Bianca Bailey, a chemical engineering major, plays trumpet for the Showtime Marching Band. With practices taking place three hours nightly, she says some sacrifices were made to get her playing chops ready for the big day. "This is something I can tell my grandkids, my great-grandkids, like, I was actually able to perform in the inauguration for our first black president."